The university withdrew acceptance letters from at least 10 students after discovering they posted offensive memes in a private Facebook group chat. What started as a private Facebook group for sharing funny memes resulted in at least 10 incoming Harvard University freshmen losing their admission acceptance offers. The school revoked their admission in mid-April after discovering the students shared sexually explicit, racist, and offensive memes, as well as messages in a group chat called "Harvard memes for horny bourgeois teens," the Harvard Crimson first reported. After joining the university's official "Harvard College Class of 2021" Facebook group, a group of students formed an offshoot messaging group that became a space to share jokes and images mocking sexual assault, the Holocaust, and often targeting ethnic or racial groups, the Crimson reported. An incoming Harvard freshman who asked to remain anonymous told BuzzFeed News that he started the "bourgeois teens" group that ultimately led to the private, more "wild" meme messaging thread, called "General Fuckups." He said he has since left the group, and that while he was not in the thread that led to his former future classmates losing their acceptance letters, students posted offensive images in his group to gain entry to the more secluded one. "For the first like four months it was great. Just wholesome memes and discussions about life," he said. "Just like an open forum for people to chat." But then things took a turn. The Tab later published a selection of the messages and memes, which feature subjects becoming aroused at a funeral or when you hear "your neighbor beating his kids," and "when the Mexican kid hangs himself in the school bathroom: piñata time," followed by "lol"s and flame emojis. To join, the group's founders made students post obscene material in the main group before letting them into the private chat. 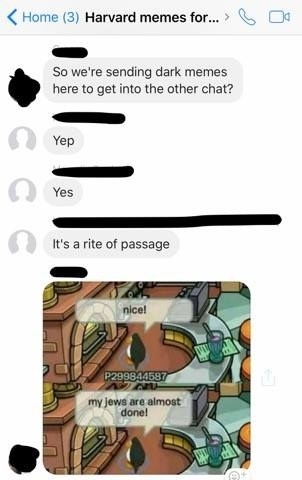 Another student sent BuzzFeed News a snapshot of a "dark meme" used to gain entry into the other chat as a "rite of passage." It shows a penguin sitting in front of an oven saying, "nice! My Jews are almost done!" "They had to post one offensive meme in the normal chat so that way the other members of the dark chat had evidence to report each other if it did all crumble (which it did). Anything that was 'wild,' as they called it. So it ranged from memes that made fun of the Holocaust to people with disabilities. General stuff you'd find on 4chan honestly," the incoming freshman said. As more students received acceptance letters at the end of March, the chat group swelled before splintering off into the separate chat in early April, he said. Shortly after, university officials found out about the group and its contents. Harvard administrators emailed students in mid-April who posted offensive material demanding they show everything they had posted in the group, according to one student who saw the email and sent it to BuzzFeed News. The student said he knows some of the students who lost their admission and they were "of many different races, genders, or socioeconomic backgrounds." 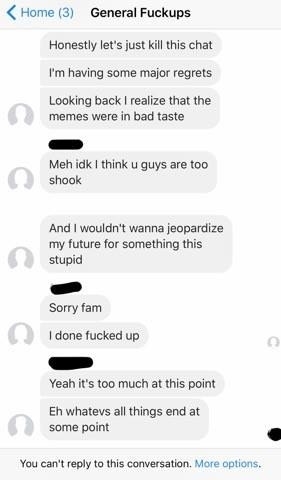 Austin Hwang, an incoming freshman who was in both meme groups, told BuzzFeed News his friend added him to the darker chat to show him "what was going on." Hwang said the more offensive memes came from the "General Fuckups" chat and that some members started to "regret their actions" and apologized. "Looking back, I realize that the memes were in bad taste," someone wrote in the thread, which was sent anonymously to BuzzFeed News. 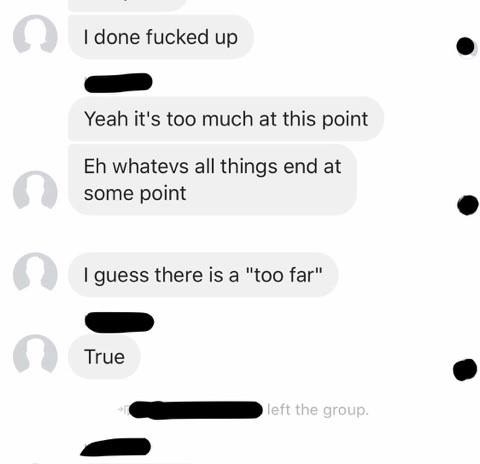 "I guess there is a 'too far,'" another person noted. In an email to BuzzFeed News, Rachael Dane, a Harvard spokeswoman, said school officials do not comment publicly on the admissions status of individual applicants, but emphasized that Harvard "reserves the right to withdraw an offer of admission under the following conditions, which are clearly expressed to students upon their admission." The university's decision to pull student admission offers over what they shared in a private messaging group has divided some students as colleges across the country struggle with how to protect free speech that is deemed offensive or inflammatory. Incoming freshman Cassandra Luca told the Crimson that she believes students can post what they want because they have the right to do so. “I don’t think the school should have gone in and rescinded some offers because it wasn’t Harvard-affiliated, it was people doing stupid stuff," she said. Saul Urbina-Johanson, a junior, pointed to another Facebook meme group called "Harvard Memes for Elitist 1% Tweens," in which people joke about pop culture, politics, and campus life. The group, which now has about 30,000 members, also sparked controversy last year after some members called for more regulation of posts that "played into racial stereotypes or targeted marginalized groups, while the other championed freedom of expression," according to an article in the Harvard Crimson magazine, Fifteen Minutes. "I think there is a mutual understanding that cracking jokes at the expense of marginalized identities is not welcomed at Harvard," Urbina-Johanson told BuzzFeed News. However, the incoming freshman noted that sharing memes, which are often racy or offensive, is now synonymous with social media — especially on college campuses, where students at schools like Columbia, Yale, and Stanford participate in "meme wars." "Obviously, for these Harvard kids, I expected a higher level of decency, and although none of the memes targeted any of my personal demographics, I did still find the memes offensive," he said. 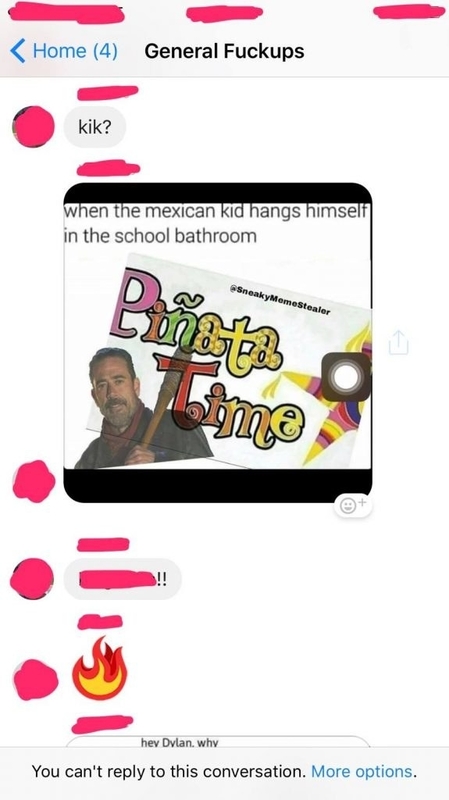 "There's a broader desensitization to these types of memes, so while I found it alarming that these were future classmates posting these, I was not as surprised as I should have been."